Top Flight Guitar Tuition in Hobgoblin Brighton! 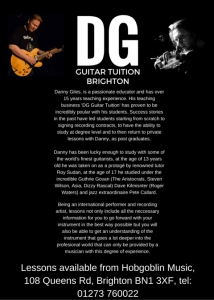 We’re happy to announce that, along with our other instrument tuition (inc. piano, violin, melodeon, accordion & singing) we’re very excited to welcome international touring artist and professional guitar player Danny Giles to our teaching staff roster here at Hobgoblin Brighton. Danny will be here every Wednesday daytime offering lessons for all abilities (from novice to expert) so don’t delay, call us today on 01273 760022 or email brighton@hobgoblin.co.uk to book a taster lesson while there is still some space left!…..